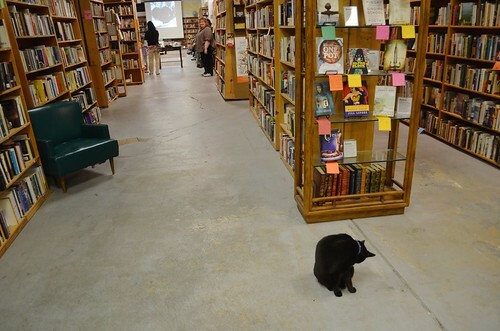 We gathered last night at King's Books to say goodbye to Miko, our shop kitty friend. Miko's kitty brother, Atticus, was stationed at the front of the store, but was distracted by his need to groom, and didn't say hello. That was probably for the best - sometimes he gets a little growly when Wylla comes into the store. Wylla does too, it can be awkward for the pair. There were about forty folks total there to pay tribute to Miko. Wylla made the rounds, said hello to her friends, and made a few new ones. 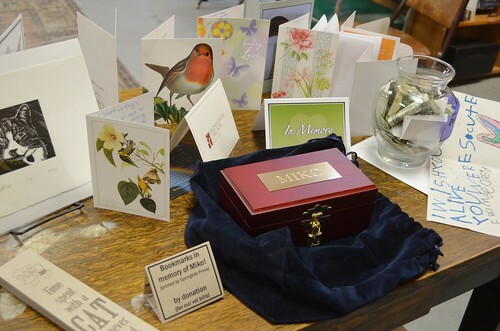 On display were some of the many lovely and touching sympathy cards that King's received from Miko's friends and fans. 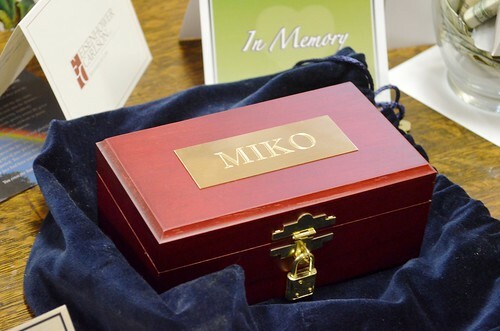 Tacoma Mausoleum and Mortuary kindly donated this box to hold Miko's remains. 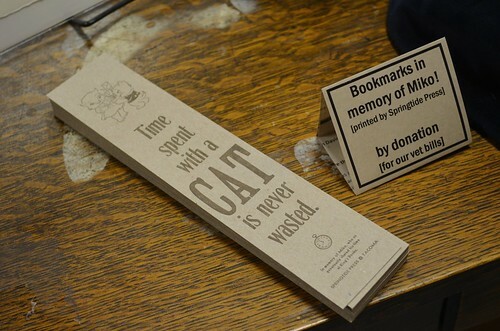 Jessica Spring (Baxter Lamm's mom) printed these sweet bookmark in Miko's memory, and to help raise money to cover Miko's medical expenses. I'm sorry I don't know who the artist was that created this print of Miko and Atticus, but it was displayed at the gathering. Also, there was a sweet slide show running in the background of photographs of Miko. 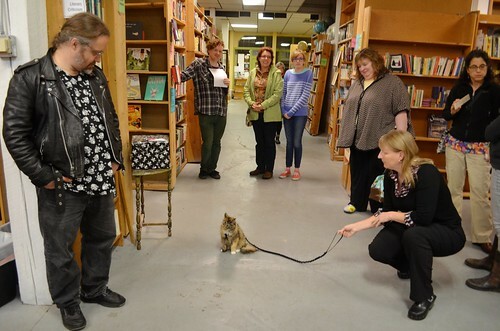 Sweet pea, Miko's keeper and owner of King's Books, said a few words about Miko and shared some stories that fans and friends had mailed in. It was touching, and triggered more than a few tears from the crowd. Afterwards, we all mingled and shared more Miko moments together. 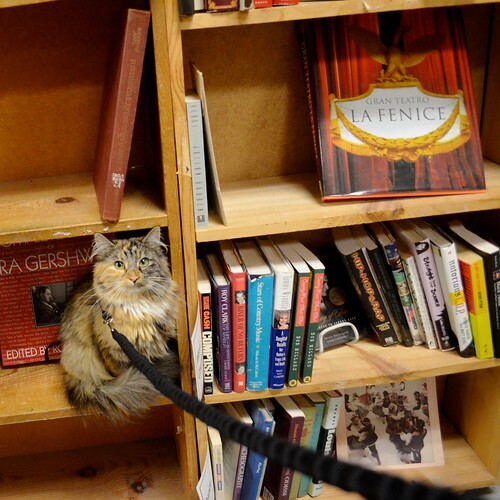 Wylla explored the store, and climbed a few bookcases. 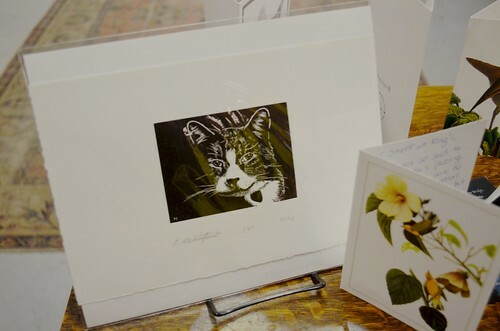 It was a lovely celebration of a cat who touched many lives, and was adored by our community. Ohhhhh that picture drawn by little Georgia is so sweet. What a nice memorial. That was a lovely tribute to a wonderful cat last night. Thanks for sharing it with us again today. Miko is truly missed. 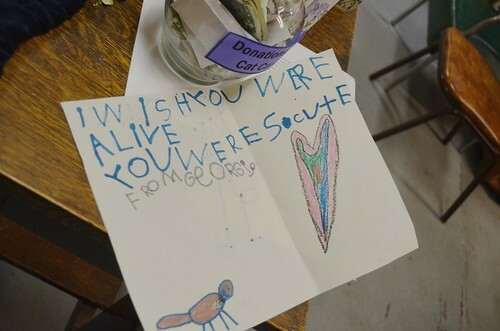 The card from George got to me. Such a loving tribute to a valued member of your community. 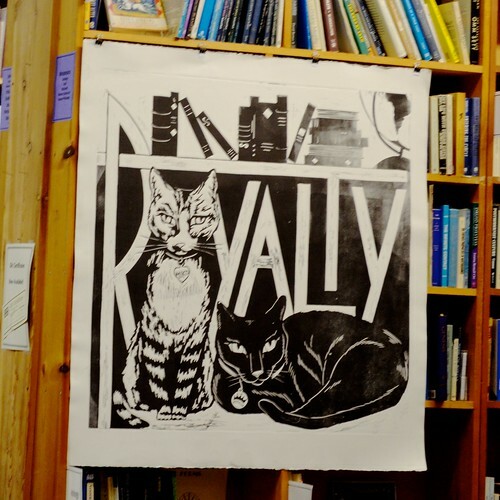 I love the print of Miko and Atticus. Royalty, indeed. The woodcut of Miko on the table with the cards is gorgeous. The whole evening is an excellent tribute to how loved Miko was. RIP, Miko....it was so heart-warming to see people come out to honor and memorialize this beautiful little spirit. And that box was GORGEOUS. There truly ARE good people in the world and this site makes me realize that every day. Thanks for all you do, Laurie, for all the kitties and your fans in cyber-space. Your site is truly balm for the soul. No longer small, but forever recognized as Shrimp Louie in our hearts! !